Looking for a group beverage for the weekend? Sandeman, the world’s leading Port producer, has created a hearty winter sangria. This Winter Spice Sangria recipe celebrates the flavors and colors of the season: fragrant cinnamon and clementines plus tart cranberries, which complement the rich red-fruit flavors in Sandeman Founders Reserve. The ruby Port is available just about everywhere Port is sold, but should you be unable to find it, substitute another ruby port. Port is also delicious served alone at the end of the meal, with the cheese course or accompanying a rich chocolate dessert or chocolate candy. 1. 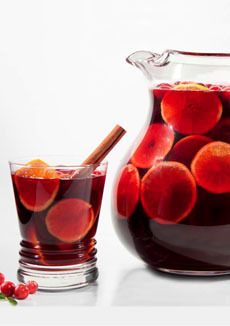 Combine Port, cinnamon schnapps, clementine pieces, cranberries, cranberry juice and cinnamon sticks in a large pitcher. Cover tightly and place in refrigerator for at least 8 hours. 2. Right before serving, add sparkling clementine juice/soda and sprinkle allspice on top, to taste. WANT YOUR OWN ROUND PITCHER? Here’s the classic round pitcher, from Waterford. This Mikasa pitcher has etched dots for a more modern vibe. Port in English, Porto in Portuguese, and sometimes written as Oporto, combining the article (“the Porto”), is the second largest city in Portugal. Located along the Douro river estuary in northern Portugal, Porto was an outpost of the Roman Empire. Port wine is produced in the region. Port is made in several expressions: Crusted, Colheita, Late Bottled Vintage (LBV), Ruby, Single Quinta, Tawny, Vintage, Vintage Character and White. Here’s an explanation of each type of Port.